Although not for public to visit, this palace is still an beautiful place to pass. Build by the founding father of Indonesia, Soekarno, this palace is used to be the 'Camp Davis' for Indonesian President. While we’re on the way to visit grandfather’s house two months ago, we passed this palace. I hope I can capture it in a day light one day. The palace was built in 1740 by Van Heuts on the land area of 25 Ha. 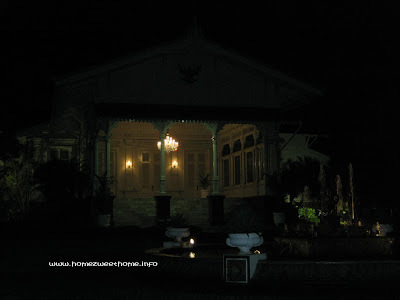 Cipanas Presidential Palace is located at the foot of Mount Gede, 103 km from Jakarta to Bandung direction, or 17 km from the city of Cianjur (West Java Province, Indonesia). Although not used daily, Cipanas Palace remains well maintained. The scenery around the palace is overgrown vegetables, fruits and ornamental plants provide beautiful shades. The whole building looks so luxurious and artistic. It looks huge and affluent. Happy Monday! Looks like it's well guarded. Here's mine. See you around! here's my MYM ENTRY! hope to see yah!